AKA Julius Caesar Watts, Jr. Played quarterback for the University of Oklahoma, and later in the Canadian Football League from 1981-86. After leaving football he served as a Baptist youth minister, 1987-94. 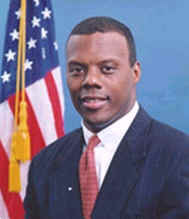 J.C. Watts is a rare breed, a black Republican, the first elected from a southern state in over 120 years. Instead of joining the Congressional Black Caucus (obviously primarily Democratic in nature), he was chosen chair of the House Republican Conference (1998). Since retiring from Congress he has headed J.C. Watts Companies, a consultant in business strategies, and is active on several corporate boards. "...they [ Jesse Jackson, et al.] said that I had sold out and Uncle Tom. And I said well, they deserve to have that view. But I have my thoughts. And I think they're race-hustling poverty pimps." On Hannity and Colmes.